These curtains are really beautiful. The red is truly a deep Ruby. They look gorgeous in my bedroom. I have since bought more and I highly recommend them. Give your window decor a vintage look with these silk curtain panels by Dupioni. 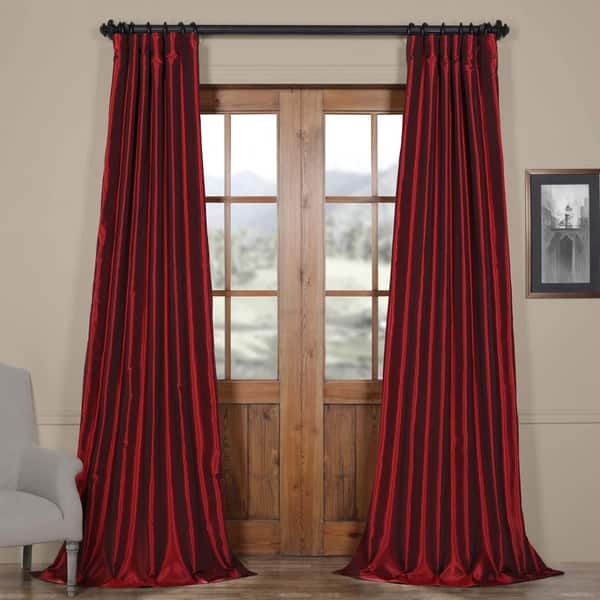 These solid ruby-red, faux-silk curtains feature a textured look and cotton and polyester with flannel interlining, giving the curtains energy-saving benefits. The red curtains include a passage pocket that makes hanging the panel on a rod a snap. Each pretty panel is available in four different lengths to ensure you get the perfect length to suit your needs. The panel is fifty inches wide, making it ideal for your large or small window, and the rod pocket design allows you to use it with a decorative curtain rod to makes the look even more unique. The curtains, which come with a 30-day manufacturer's warranty, are an ideal placement and covering for French doors that lead out to a patio. Use the drapes to keep your home warm in the winter months and to maintain a temperately cool indoor climate in the summertime. The drapes are ideal treatments for windows that feature a northern or southern exposure. Fantastic quality - fabulous price!!! A MUST BUY!!!!!! We took the risk and ordered 6 Ruby Vintage Faux Textured Dupioni Silk Curtain Panels. The quality was absolutely amazing, very heavy and very expensive looking. These type of curtains would have been $1000 a panel at Restoration Hardware. I tried to steam them but that didn't take all the creases out. I then ironed them on the ruby side on a medium steam setting and they ironed perfectly. No shiny marks after ironing. I would highly recommeMd these curtains and can't say enough about them. ENJOY and ORDER NOW!!!! I adore these curtains - they make my living room look luxurious and elegant. It is hard to tell what you are getting online these days, however, the ruby in the ad states it perfectly. (pictures do not do curtain color justice, although it gives an idea). After reading (mostly) all the five star reviews, I had no doubt in my mind that I would be happy - I am very happy with the gorgeous texture of the fabric, the beauty the vintage ruby red look gives (hard color to find), and that their fantastic quality was worth 100% their value. These are the only faux silk curtains I have ever purchased and there are a great find. The rest of my curtains are all 100% silk, I compared this curtain to my deep red, real silk curtains and in my opinion the difference was so slight you won't notice. The red is rich and deep hue and the hems are well done. The lining blocks out most sunlight. Yes you can find faux silk for less but the quality of this product warrants a slightly higher price. I am very happy with the 4 panels I purchased. The color was just as shown. They are heavy panels with a beautiful rich deep red color. They go so well with my red and gold tuscan style living room. We have 17' ceilings and I needed long curtains to dress up the tall windows to give the living room some warmth and they worked perfect. My husband was skeptical of putting up drapes, but once they were up he loved them and asked me to put panels up in between our curved set of windows in the formal dinging room which I have been trying to convince him of letting me do now for a while. They look expensive so of course he asked how much they cost right away. You can't beat the price of these for the quality you get. I like the look of the puddled drapes (which these would work very well for if that is what you are going for) but living in AZ with scorpions we didn't want anything dragging on the floor giving them something to hide under if they get in the house. We have them hanging just above the floor and they hang nice. I would highly recommend these! Other than trying to get the wrinkles out because these are so long, I don't have any complaints. I was very pleased with the way the material looks after hanging these up - not cheap and flimsy. These are very substantial curtains. I think the lining helps immensely. I had a really hard time finding curtains that were going to be long enough and in the color and needed and these fit the bill perfectly. I ordered the 120" length for our rod installed at 110" high so they would "puddle" on the floor. The weight is substantial, color rich and deep. They are worth the extra expense to get this quality. I'm very pleased with my purchase. The curtains are a beautiful wine color (or a deep crimson). The picture on the computer doesn't do the curtains justice. I purchased these panels to replace very expensive dupioni silk, that had faded from sun light and where thinning after being professionally cleaned. I decided to go with synthetic for durability this time. I have always wanted red drapes, but my husband was not in agreement. This color is a perfect compromise. It is not bright. I sold the color by saying, "it looks like a glass of Cabernet wine" and they do. They make the family room. They are heavy. Will block light, hot and cold. They work best stationary. The tabs make opening and closing difficult. Beautiful curtains. Love the texture. Curtains are great and worth the price. Both the curtain and the lining are thick and heavy. I steamed mine in the dryer to get the wrinkles out. The fabric has a sheen to it and it did come with hooks but I chose to use a rod. All stitching looks good too. Would recommend. Rich color, but it shades to black when up. These curtains are stunning. The color was, indeed, a rich ruby tone. They are quite substantial, heavy, with a great sheen. I am extremely happy with this product. Had I bought them anywhere else, I know that I would have paid double! Love them! Love these curtains. Nice weight to them and good for blackout. I love these curtains!! Beautiful color, heavy and very well made. beautiful drapes!!! I bought this for my kitchen area for our back doors. I love The way they look and they’re lightweight not to thin. I’m very happy with my purchase!!! Thanks overstock!!! We just got these and hung them up, so my opinion might change if they deteriorate rapidly. The fabric and quality are very good. They hang beautifully, but the color is nothing like the pictures on the web site. There is one picture on the site that looks more purplish, and that is a closer to the true color, with black highlights as the light changes. We are replacing bright red drapes and were hoping for a brighter red like those, but we can live with them as is. THEY DO NOT BLOCK LIGHT WELL AT ALL! I even called to ask about this before ordering, but of course the youngster on the telephone knew nothing more than what was written on the web site (why does Overstock even bother retaining those people anymore). I was hoping for total blackout like the site description said, but again it is something we can live with for now. Maybe when time for first cleaning, we will have them relined. Rich color, heavy fabric....Love them! Nice quality and will keep the light out of a room. Color on the cool side and not on the warm side. Great lux looking product. Love the look in my formal sitting room. "do these not come in larger panels? I want them but this is to small for my large living room window." This item is only offered in 50-inch widths. "How wide is each panel?" "Are there matching tie backs to go with these curtain panels?" We currently do not offer matching tiebacks. "Do this get burnt by sun? My original red dupioni silk curtains got faded because I get direct sunlight thru this window." Hello ij, these have a white lining, you should not have any issues with fading. Thanks for shopping with us! "What is the color of the lining on the back of the curtain? Is it white or an ivory? Thanks." Hello Lesa R., the panels have a white lining. Thanks for shopping with us! The luxurious effect, rich color & the silk like sheen are exactly what I was looking for & at a reasonable price compared to custom drapes. The customer reviews also aided in my decision. I love the Dupioni Silk product and was attracted to the faux option for cost savings. The color looks amazing. I hope they're as beautiful in person. "what is back tab? Can I hand this curtain on rings rather than inserting through a rod?" Thank you for contacting us riverdancehk. Unfortunately not at this time. Please let us know if you have any further questions. You can definitely hang the curtains on rings. We used the pins which thread into the curtains and hang onto the rings.